Andy Murray is set to inspire young people across the UK in a one-hour webcast, produced by BBC Scotland. The Wimbledon champion will answer questions from an audience of 200 Stirlingshire pupils, as well as a live online audience from around the UK. A number of celebrities will also make an appearance, asking a few cheeky questions via pre-recorded messages. The event will be broadcast live from Wallace High School in Stirling at 14:00 BST on Wednesday, 23 April. Murray said: "I'm really looking forward to the event and interacting with different school children across the UK. "I'll be talking about my experiences in tennis and sport, but importantly, how I got there, the business-side of my career, why charity matters, social media, my dogs Maggie and Rusty, in fact anything people want to know, so get those questions ready." The broadcast is a co-production between BBC Scotland Learning and BBC Get Inspired. Get Inspired aims to bring BBC audiences the stories behind big sporting events - the sports stars, the celebrities, and the grassroots projects creating a lasting legacy. 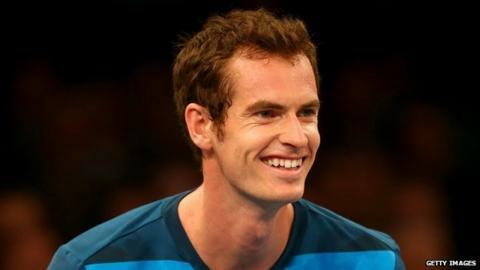 Gerald Strother, senior producer of BBC Learning, said: "For young people across the country to have this kind of access to Andy Murray is just fantastic. "It's the kind of thing they'll remember for the rest of their lives." Scott Pennock, head teacher at Wallace High School, said the school was privileged to be hosting the broadcast. "This will give young people from across Stirling schools and the UK a chance to interact with one of our national sporting icons," he said. "As a school that values attitude and effort above all else, we are delighted that someone who has displayed these virtues so strongly in a sporting context will be sharing the secrets of his success with our young people."